Please help out the Evergreen Community and sign this petition to stop DEED and ELID from raising our sales taxes. Even if you live outside of the proposed tax district, you may want to visit or shop in Evergreen. It only takes a minute of your time. Here is the No2ELID Petition. Please help to spread the word to your friends and neighbors. DEED has had much publicity in favor of this tax, and almost no publicity from those opposed to a new Tax Authority. The (DEED), Downtown Evergreen Economic District is a private group of downtown Evergreen property and business owners proposing to create a new layer of government called a "Local Improvement District" for the greater Evergreen area. The estimated annual revenue generated by the tax is $900 thousand per year with which ELID intends to construct roundabouts & other urban-type projects that would be detrimental to our mountain environment. This idea will soon come to the Conifer area and we will all pay much Higher Sales Taxes in the future. Why would a roundabout be "detrimental to the mountain environment"? I know nothing about DEED or ELID, but I believe replacing that traffic light in downtown Evergreen with a roundabout would be just about the best thing to happen to that community. Why would a roundabout be "detrimental to the mountain environment"? 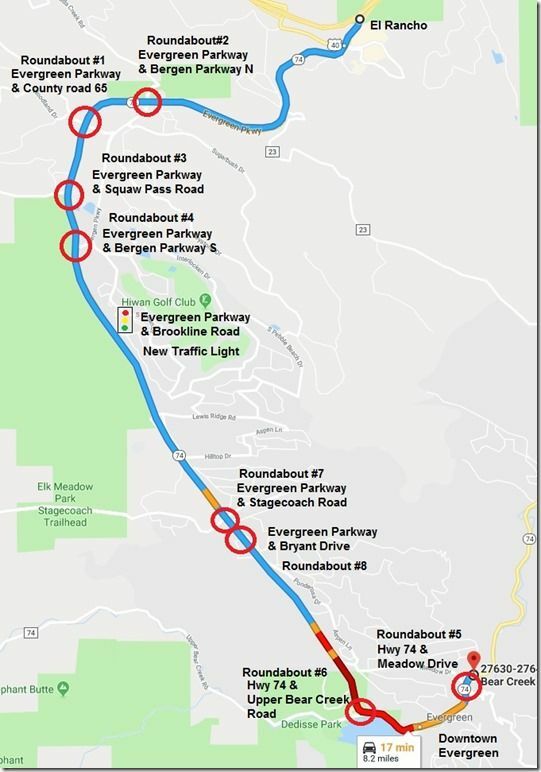 ....., but I believe replacing that traffic light in downtown Evergreen with a roundabout would be just about the best thing to happen to that community. I also agree that a roundabout would have been a good solution, but it likely would have been an engineering nightmare due to close proximity of businesses and Bear Creek below the road. One building was already removed when the intersection was built. And don't forget the elk, and a roundabout? I think most folks have seen the picture of about 75 or so elk working their way through the current stop light. Waterman, you might be right. I can't help but think that something the size of the roundabout at Marshdale would be possible in downtown Evergreen, without significantly impacting businesses ... but then again, my sense of scale is sometimes challenged. Funny the discussion here is all about Roundabouts. Originally, this group had plans for (8) roundabouts in Evergreen. The current plan is for (2) roundabouts. No Roundabout is planned for the 74&73 intersection. Here is a link to the current ELID project list. Sidewalks, curb & gutter, Raised medians w/pretty flowers, Raised crosswalks etc... Just like in the big city! I respect your opinion luigi, but mine is they facilitate flow as evidenced by the one at 73 and N. Turkey Creek Rd. Without question most folks know how to use that roundabout. A few hesitate unnecessarily, but in my opinion that's probably less than 15 percent and I drive this one sometimes multiple times each day. The intersection flows better compared to before the roundabout, especially considering the number of buses due to the bus barn at that location. Where I wish a roundabout would be installed is at 73 and the complex with the Staples store. Oh, and I'm not in favor of higher sales taxes in Evergreen as mentioned by the OP. Might be a first, me agreeing with Taranis, but there it is. Any driver who is too stupid to know how to negotiate a roundabout is really too stupid to be allowed to drive in the first place. Roundabouts are about as simple a way to manage an intersection as there is.